CEDAR RAPIDS, Iowa – Classes resumed at Collins Hills High School in Suwanee, Ga., late last week following a comfortable holiday break, but they did so without senior Nasim Nunez in attendance. Nunez, a stellar class of 2019 shortstop prospect from Lawrenceville, Ga., had permission to miss the first day back because he had instead scheduled the baseball equivalent of a career day. He had a “home visit” with personnel from the Atlanta Braves, a full six months ahead of the 2019 MLB June Amateur Draft. Nunez was speaking with Perfect Game over the phone when he made that comment so it shouldn’t surprise anyone that the conversation was baseball-centric. More specifically, it centered on the end-of-the-year announcement that the 5-foot-9, 160-pound, 18-year-old Nunez has been named the 2018 PG Finest in the Field Defensive Player of the Year. His talents – in the middle-infield, on the base paths and at the plate (he is a switch-hitter) – have certainly received much-deserved notice throughout his standout, three-year PG All-American career. He is ranked the No. 17 overall national prospect in his class and has signed a letter-of-intent with Clemson out of the powerful ACC. Nunez made a habit of impressing PG scouts, MLB scouts and college coaches and recruiters at 31 PG events since 2016, often while performing on some of the biggest stages offered to high school-aged prospects from coast-to-coast. There have been 10 PG all-tournament selections, three PG WWBA tournament championships and three inclusions on PG showcase Rawlings Top Prospect Lists. The brighter the spotlight, the brighter Nunez’s star shines. “(Nunez) has the ideal physical tools to be a high-level defensive shortstop. He's a 6.28 runner with exceptional first-step quickness and has 95 mph arm strength across the diamond, all surrounded by bouncy and balanced athleticism. And like most of the truly outstanding defensive shortstops, Nunez plays the position with imagination and flair and can make the highlight reel play along with making outstanding plays that are much more sublime but every bit as special. This past summer, Nunez was invited to perform at both the National Showcase and the All-American Classic, two of PG’s most high-profile annual showcase events for incoming seniors. The National returned to Tropicana Field in St. Petersburg, Fla., in June and the Classic was played at Petco Park in San Diego for a 10th straight year in August. This year’s National Showcase was nothing short of “Showtime” for Nunez. He ran a blistering 6.28-second 60-yard dash (3rd best effort at the event), threw 95 mph across the infield (2nd best) and generated substantial buzz with his overall play. But there were some challenges, albeit self-induced. The 95 mph throw across the infield was also a bit of a surprise to Nunez, who laughs easily during conversations. He had been in Kansas two days before the workout playing with the MLB Breakthrough Series team and was asked to go out and pitch a couple of innings. He admitted that when he did the infield workout at the PG National, his arm was actually feeling a little fatigued. So, despite a queasy stomach while running the 60 and a tired arm while throwing from shortstop to first, Nunez managed to turn in personal-best efforts that came close to being event-bests. It’s remarkable what a shot of adrenaline that comes with performing on the biggest of stages is capable of producing. When Nunez was asked who specifically has helped him become the elite defensive shortstop that he is today, he mentioned three men: former MLB second baseman Junior Spivey, former MiLB second baseman and travel ball coach Joseph “JoJo” Batten and former college player and current instructor Ariel Polanco. All three were able to provide Nunez with valuable insights into fielding the position, and when the pointers and lessons were stitched together, they helped create the total package. He credited Batten, one of his first travel ball coaches, for helping him with his footwork and taking the time to break down some of the position’s intricacies. Batten showed Nunez how to take the three steps around the baseball and come through – even from a backhand – to make a solid, easy throw. Polanco, Nunez said, “put repetition in my head” while working out at a D-Bat training facility in Johns Creek, Ga. Nunez gets in his reps there, fields ground balls off a machine and uses pancake gloves and that help him keep his hands soft so he has a better feel for the ball. Spivey, according to Nunez, is more of an “instinctual” type of coach. Spivey explains the importance of being prepared even before the pitch is thrown and has Nunez thinking about what he’s going to do with the ball before its hit in his direction. Also, the importance of awareness in terms of where everyone is on the field and making sure everyone is working together to get the job done. Perfect Game not only ranks Nunez as the No. 17 overall prospect but also the No. 4 shortstop prospect in the national class of 2019. Fellow PG All-Americans Bobby Witt Jr. (No. 1 overall), CJ Abrams (No. 6) and Rece Hinds (No. 8) are the middle-infielders ranked ahead of him. The four enjoy very close relationships which isn’t surprising since they’ve spent so much time together at all of PG’s premier events over the last two or three years. Nunez played his travel ball with the esteemed Winder, Ga.-based Team Elite organization, and earned all-tournament recognition at five PG WWBA events in 2017-18 playing with Team Elite squads. He called Brad Boras-led Team Elite a “great program” and is proud of his association with the group. (Nunez was also all-tournament at four events while playing with the Team 360 Hawks in 2016-17). 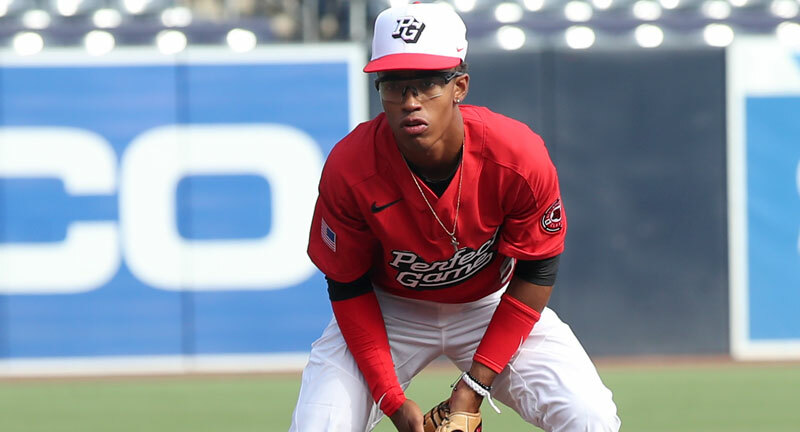 At two elite events in October – the Ways To Play Powered by MLB & PG in Emerson, Ga., and the PG WWBA World Championship in Jupiter, Fla. – Nunez switched caps and jerseys and played for the MLB Breakthrough Series team. He had also played for the Breakthrough Series at the 2017 PG WWBA Underclass World Championship and earned all-tournament recognition. He also welcomed the opportunity to play alongside several of his peers who were included on the Breakthrough roster, guys like Isaac Nunez, Sanson Faltine III, Darius Perry and Marquis Grissom Jr, among others. And, perhaps most importantly, he learned a lot about himself as a ballplayer. It was only in the spring of 2017 that Nunez decided to become a switch-hitter, and a year-and-a-half into it he’s proud to report that it’s been working out pretty well for him. He said he sees the ball coming out of the pitcher’s hand by switching from one side of the plate to the other depending on the pitcher’s handedness. In one game at the National Showcase, Nunez ran-out a pair of infield singles, one hitting righty and the other hitting lefty. ; he ran from home to first in 4.33 seconds from the right side and in 4.14 seconds from the left side. According to DiamondKast year-long batting stats, Nunez played in 68 games in 2017-18 and hit .349 (61-175) with six doubles, six triples and 61 stolen bases. Officially listed at 5-feet-9, 160-pounds, Nunez has heard the word “diminutive” used to describe his stature. He hears it, quickly chases it out of his mind, and then goes about the business of playing bigger than what the tape measure and the scale might say. Nunez has signed his letter of intent with Clemson and his college choice wasn’t made hastily. As a high school freshman, he sat down with his mom and they made a list of schools he was interested in, in an effort to get a jump on the college recruiting process. Clemson was one of the top schools on that list and was one of the first schools to make contact. This was head coach Monte Lee’s first year with the Tigers, and after Nunez had the opportunity to meet with Lee on an unofficial visit, he was hooked. In its first listing of the top 300 overall (college, juco, high school) prospects in the 2019 MLB June Amateur Draft, Perfect Game slotted Nunez at No. 42. The draft comes up in conversations with his parents every now and then but Nunez is staying grounded. Nasim Nunez missed a day of school last week, but he wasn’t playing hooky. Far from it, in fact.